There's Nothing To Do Here, And It's Perfect : 13.7: Cosmos And Culture Robert Irwin's current showing at the Whitney Museum of American Art is astonishing. But why? Alva Noë gives it a good look over and finds that the work is nothing and everything at once. 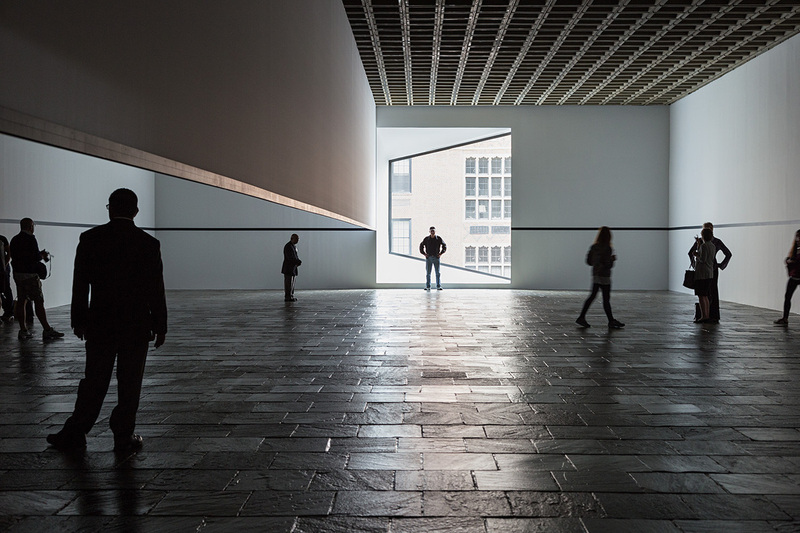 Visitors explore Robert Irwin's Scrim Veil--Black Rectangle--Natural Light during its 2013 reprise at the Whitney Museum of American Art. 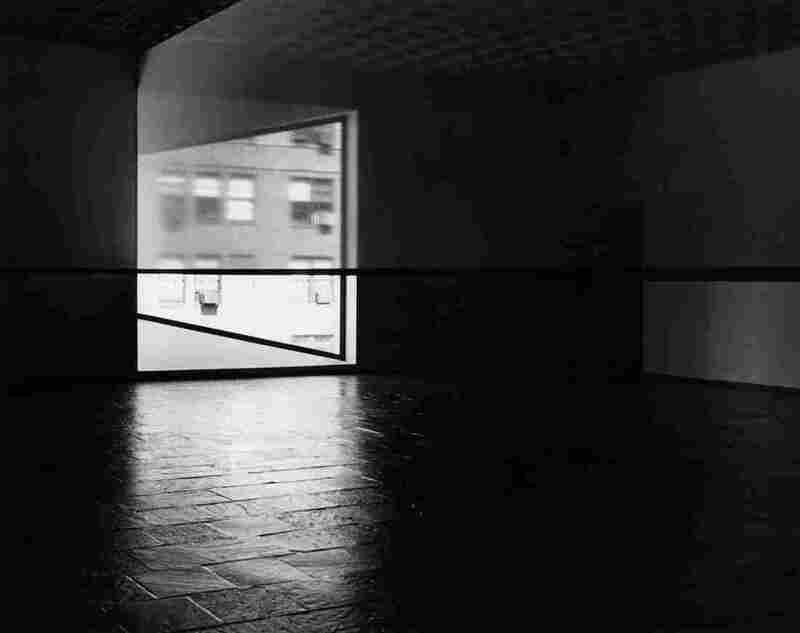 The elements of Robert Irwin's installation at the Whitney Museum of American Art — the show ends today — are named in the work's title: Scrim Veil--Black rectangle—Natural Light. There's no mystery. No magical ingredient. It's a large rectangular room with a black floor divided lengthwise by a taut curtain of thin fabric hanging down to about head height; the fabric is translucent, from some angles invisibly transparent, from others impossible to see through; the fabric has a thick black border (another rectangle); there is a thick black line (rectangle) painted on the walls, bisecting them horizontally; light coming through a single large window at the end of the room. And yet you could practically hear people gasp as they entered the room on the Whitney's fourth floor. Somehow the combined effect of the elements was not only gorgeous, but astonishing. Yes, there was an optical trick. You could not always quite see the scrim. And because of the black bar of its border, and the similar bar on the wall behind, you had a sense that the two bars were one. You lost a sense of their location in space. But the fascination of the piece doesn't come down to mere optical play. I wish I understood what it does come down to. One remarkable feature of the installation is that it has no focus. You're in it, for one thing, so you can't look at it. There isn't any one thing for you to contemplate. Or rather, everything — the window, the scrim, its border, the floor, the wall, the other people in the gallery — command attention equally. Compare this with James Turrell's thematically kindred exhibition now at the Guggenheim just uptown. With Turrell you know just what to look at; there is something to inspect. Or compare it with the installations of Richard Serra, which I've discussed here in the past. Serra's work disorients you and compels exploration. You can't just stand there. You need to do something. But not so with Irwin. There is nothing to do here. Or, I suppose, there is everything to do. The installation is just a place. A place to be. It is a pure place. Space. And light. Could this be why it feels so good to be there?